Located in Transyvania County, North Carolina, near Brevard North Carolina, Sylvan Heights is a master planned residential community consisting of approximately 60 lots. 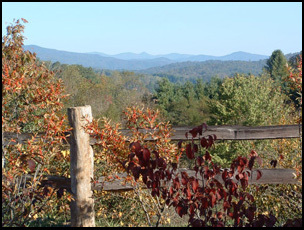 Established in 2005, Sylvan Heights offers western NC mountain land with spectacular views of the Blue Ridge Mountains. Sylvan Heights is another development of Sylvan Resources LLC, the award winning upscale conservation community in Brevard North Carolina. Large view lots with great house sites and outstanding privacy are now available for the discerning buyer at Sylvan Heights Community, in Transylvania County near Brevard North Carolina. Sylvan Heights is a new community offering lots of outstanding value, including Blue Ridge Mountain views, close proximity to Brevard and Asheville, NC, and natural amenities including a pristine fishing lake, mountain streams, multiuse trails, and a community park and frisbee field. With so much to offer, Sylvan Heights is a "must see" for those contemplating an investment in North Carolina Mountain Real Estate. Sylvan Heights, from the developers of nearby Sylvan Habitat, continues the tradition of quality residential real estate development, for which Transylvania County and Brevard NC are so well known. The western North Carolina mountains are one of Americas foremost resort and retirement areas, and Sylvan Heights is perfectly situated within this wonderful area. It is great place to build your primary residence, your mountain vacation home,or retirement home. Located atop Kelley Mountain with elevation up to 3000 feet, it offers Blue Ridge Mountain views, yet is only 10 minutes from charming downtown Brevard, North Carolina. Vibrant Asheville, NC and Hendersonville, NC are less than 30 minutes away. Recreational and cultural opportunities abound in Transylvania County, known as the Land of Waterfalls: Pisgah National Forest, with its myriad trails, waterfalls, and amenities is only minutes away, and is surmounted by the Blue Ridge Parkway. Dupont State Forest, Gorges State Park, and numerous other parks and recreation areas abound. Cultural opportunities are available at community-friendly Brevard College, the Brevard Music Center, and in numerous venues in Hendersonville and Asheville, NC.